The long-range, anti-ship ballistic missile known as the DF-26—dubbed the "Guam-killer" because of its ability to strike targets on the U.S. western Pacific island—was moved in northwestern China, China Central Television reported Wednesday. It was the first time the anti-ship ballistic missile was showcased on state television since the weapon was declared operational by China in April. The television report in Chinese showed a convoy of the road-mobile missiles on roads and at a base in China, as well as in a military parade. U.S. government and private sector experts said the video showed DF-26 missiles in two different locations: In the Gobi Desert in western China and at a base in central China. The CCTV report said an unspecified number of DF-26s were mobilized to northwest China plateau and desert areas. The missiles are now capable of conducting road-mobile operations across the country, the report said. Exactly when the new missiles were mobilized was not disclosed. However, an unidentified military expert quoted by the Communist Party newspaper Global Times linked the missile mobilization to the recent freedom of navigation operation in the South China Sea by the USS McCampbell, a guided missile destroyer. The expert stated that launching mobile missiles from deep inside Chinese territory is designed to thwart missile defenses. The initial phase of a ballistic missile launch is slow and easy to detect by satellites and other sensors used to track and target missiles. The newspaper stated that the movement of DF-26s is a reminder that China is capable of safeguarding its territory. "Even when launched from deeper inland areas of China, the DF-26 has a range far-reaching enough to cover the South China Sea," the expert said. The McCampbell passed within 12 nautical miles of the disputed Paracel Islands in the South China Sea in a bid to establish that the zone around the islands is international waters and not Chinese maritime territory as Beijing claims. The Pentagon's latest annual report on the Chinese military described the DF-26 as a formidable weapon. "China has also deployed a nuclear-capable precision guided DF-26 intermediate-range ballistic missile capable of attacking land and naval targets," the report said. The McCampbell passage near the Paracels on Monday was part of a program to challenge China's excessive claims to control some 90 percent of the South China Sea, a spokeswoman for the Navy's Pacific Fleet said. The operation also was designed to "preserve access" to international waters, said the spokeswoman, Lt. Rachel McMarr. The PLA's Southern Theater Command said its naval and air forces challenged the McCampbell and warned it to leave the area. "We urge the U.S. side to immediately cease such provocative actions," said Sr. Col. Li Huamin, a command spokesman. "The PLA Southern Theater Command will remain on high alert, closely monitor relevant maritime and air situations, and resolutely safeguard China's sovereignty and security." The National Air and Space Intelligence Center (NASIC) reported in 2017 that the DF-26 is a two-stage, road-mobile missile. The center stated in a report that the DF-26 has been described as "one carrier, many warheads." More than 16 launchers were deployed as of 2017, the report said. The missile is capable of conducting strikes on many types of targets, including large ships. The weapon also requires little support and can be launched quickly. The Pentagon annual report said the missile's maximum range is 2,485 miles—a long distance for a precision-guided missile that requires satellites for navigation. "The DF-26, which debuted publicly in 2015 and was paraded again in 2017, is capable of conducting precision conventional or nuclear strikes against ground targets that could include U.S. bases on Guam," the Pentagon report said. Hans Kristensen, an analyst at the Federation of American Scientists, said the DF-26 base shown in the CCTV video is the 666 Brigade located in Xinyang, China, about 520 miles south of Beijing. The Xinyang base is located 2,337 miles from Guam—inside the DF-26's maximum range. The missiles at that location also can cover the entire South China Sea, which is about 1,900 miles from Xinyang. "Although the details are murky, we’re probably seeing launchers from the first operational DF-26 brigade at Xinyang deploying on training in the eastern parts of the Qinghai province," Kristensen said. "From Xinyang, the DF-26 is capable of targeting Guam, Japan, and most of India." The United States has no counterpart to the DF-26 because of adherence to the 1987 U.S.-Russian Intermediate-range Nuclear Forces Treaty. President Trump announced last year that the United States is withdrawing from the INF treaty that bans intermediate-range missiles with ranges between 310 and 3,400 miles because of Russian violations of the treaty. Moscow has deployed a new SSC-8 ground-launched cruise missile in violation of the accord. 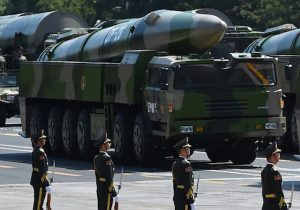 A Strategic Command official told the Washington Free Beacon last year that plans for deployment of a new low-yield nuclear weapons was prompted in part by China's deployment of medium- and intermediate-range nuclear missiles. To counter Chinese DF-26 and other missiles, Strategic Command has urged deploying new sea-launched nuclear missiles fired from either surface ships or submarines.